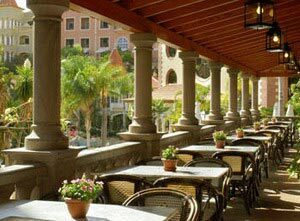 The Gran Hotel Bahía del Duque Resort rises majestically next to the beautiful beach of El Duque. Its architecture is inspired by canarian houses of 19th Century and the harmony of its colours, carrying us to a place where time acquires a new dimension. 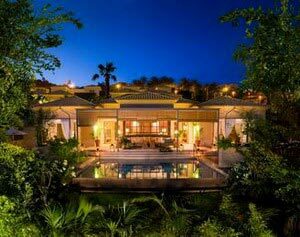 Surrounded by subtropical gardens, these houses open out to fresh patios and picturesque squares inviting to relax. A unique harmony, from the soft colours of the facades to the green gardens and swimming pools cascading down in waterfalls down to the beach. The traditional style of uniforms and the exquisite staff service, along with an extensive program of activities and a wide gastronomic offer, make this resort a real paradise and a delight for all senses. Only 15 Km away from the South Tenerife Airport "Reina Sofía". 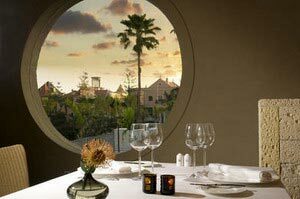 Las Aguas Restaurant is situated in the new Villa zone of Gran Hotel Bahía del Duque Resort. Designed by the prestigious interior decorator Pascua Ortega and run by Salvador Gallego, the restaurant offers a unique and exclusive atmosphere, where the exquisite gastronomic selection and a relaxing view leave you with a complete well-being experience. The excellent wine cellar with an international selection of wines deserves a special mention. El Bernegal - Diversity of Buffets. Restaurant and Terrace with show cooking and daily breakfast service. La Brasserie - French cuisine in an environment full of charm and colour. La Trattoria - the Italian touch of the hotel, a warm and funny environment. Open for dinners. 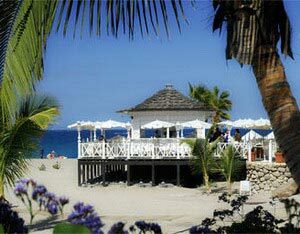 Beach Club - All the sea flavour, a place to taste seafood, rice, fresh fish and the best dishes of Mediterranean cuisine. 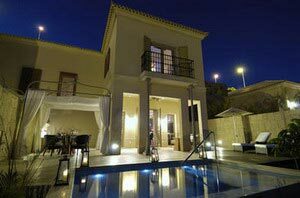 All with beautiful sea views and beside the main swimming pool. La Tasca - Spanish cuisine offered in a great variety of styles going from elaborated dishes to typical tapas and rations. Live music with Spanish guitar. 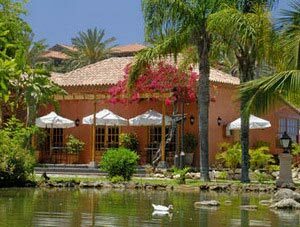 La Casa del Lago - The real taste of Canary cuisine, as well as a varied selection of fresh fish in the Promenade of the Beach of El Duque. La Hacienda - A different gastronomic proposal with the colourful Latin environment. A gastronomic tour can be made through the cuisine of three continents. 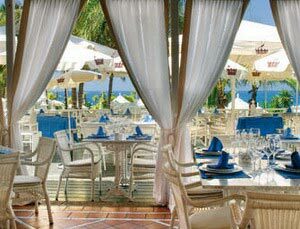 Café la Bahía - Informal restaurant in the Beach Promenade with an incomparable view to the Ocean. 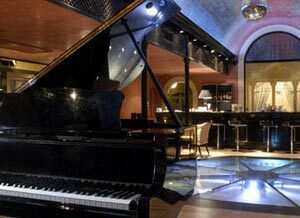 Piano Bar - Wonderful environment to enjoy hot drinks and cocktails with live music and shows. 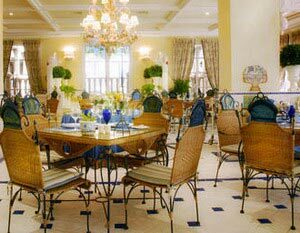 Bar Hall - Located facing the lobby, it is the appropriate place to enjoy a cup of tea or coffee under a magnificent cupola that covers the lobby of the resort. 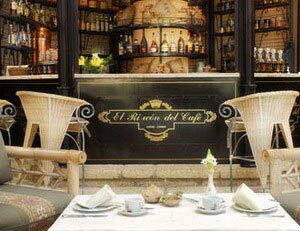 Rincón del Café - The best area of the hotel to taste an exquisite coffee or an impeccable selection of teas accompanied by classic bakery and sandwiches so adequate for the afternoons. 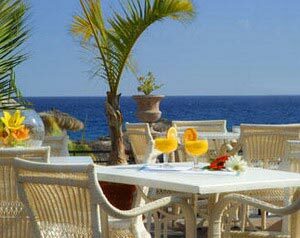 El Chiringuito - On the beach promenade, perfect for refreshing or enjoy a drink near the beach and the sea. 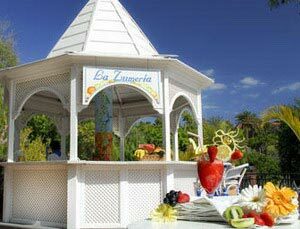 La Zumería - Natural juices made at your choice, beside the sea water swimming pool and on the beach promenade. 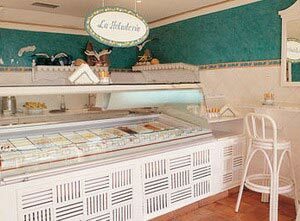 La Heladería - Your choice of refreshing icecreams. Bar Azul - Ample menu of salads, snacks and sandwiches, with views of the sea. Reading room with national and international press, bridge and billiards room, 2 tennis courts, a squash court, 2 paddle courts, jogging circuit, botanical walk, beach volleyball, archery, darts, ping pong, boule, giant chess, gym, mountain biking, aqua gym, aerobics, pilates M.A.T., dance classes, painting, crafts, cocktails and cuisine, body sculpting, steps, personal trainer. Spa - Inspired by the great climate and natural landscape of the island of Tenerife, the internationally acclaimed spa consultancy firm ESPA has created exclusive treatments and rituals based on the unique resources offered by the environment; marine extracts, volcanic lava and aloe vera, raw materials indigenous to the Canary Islands. ESPA has developed a unique offer which combines both modern and traditional methods using the Ayurveda philosophy, European practices and incorporating hot stone therapy. Both the DeLuxe (garden view) and Premium (sea view) rooms are distributed among 21 houses, each one with a different environment in which everything has been set in order to offer you a maximum comfort. 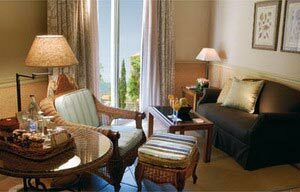 Junior Suites - These spacious rooms can be equipped with twin or king beds. 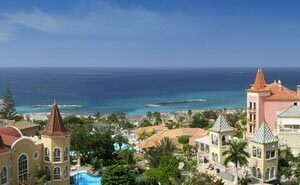 All have a balcony or a terrace, with magnificent views over the Atlantic Ocean or the lush subtropical gardens of the hotel. 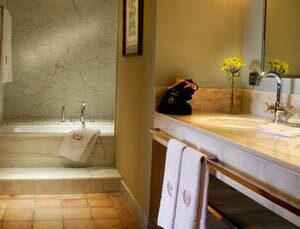 Suites - Our suites have been carefully designed to provide you harmony and space. A perfect accommodation for your family or friends with the greatest comfort. 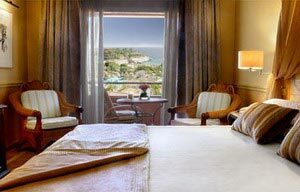 All suites have a balcony or a terrace, with magnificent views over the Atlantic Ocean and the lush subtropical gardens of the hotel. One or two rooms with independent bathroom and sitting room. Family Suites - The approximate surface of our family suites is 100m2. 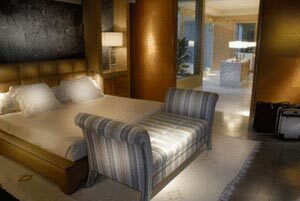 The suites are composed of two bedrooms, two independent bathrooms with shower and bath and a separate living room with TV TFT. Some of the suites dispose of a jacuzzi in the garden. 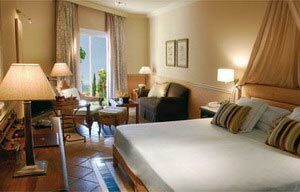 The equipment of the family suites is similar as that of the other rooms in the hotel. 24 hours of room service. As a vacation destination, the Gran Hotel Bahia del Duque Resort offers a wide range of sport facilities inside the resort. There are 800 meters of a golden sand beach with a direct access from the hotel, 5 swimming pools: 3 with freshwater (2 heated and one children's pool), and 2 with sea water, Shopping Gallery and Mall near the hotel, Internet Cafe, Astronomical Observatory. 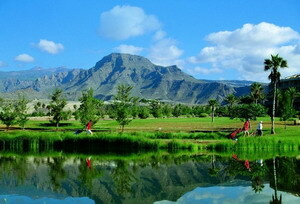 From 10:30 AM to 7:00 PM the hotel offers a wide range of activities: sports, cultural events, games and competitions. In the evening there are shows with timetables varying depending on the nature of the event. Beach sports: hang gliding, jet ski, parascending, water sports: diving, windsurfing, sailing, water ski, deep sea sport fishing, whale watching.